Warning: you may need sunglasses as you read this Black Diamond Casino review – because this online casino shines above the rest. Just checking out the bonus codes below, we can see that they have multiple offers to choose from. And no-deposit offers – the BEST kind of bonus code! This Black Diamond Casino Review will tell you all about this great casino! Black Diamond is regulated and certified in Curacao. This causes some to call it the Jewel of Curacao! Black Diamond is committed to bringing the finest, most player-friendly casino on the internet. When they talk about themselves (About Us) they use terms such as design, innovate, create, and improve. This casino is fully aware that no matter how they try to be perfect there is always room for improvement. To Black Diamond, being a great online casino, is far from just OK. The management team is thoroughly socially conscious. They urge all players to reduce their individual carbon footprints by becoming more efficient in energy use. Black Diamond is available in three platforms: download, instant play, and mobile. Truth be told, there is no longer any really good reason to download an online casino. However, Black Diamond takes up very little space on your hard drive so some players still choose to download it. The reason most gamers play either in instant play or on their mobile device is because the graphics for these two platforms have improved so much, there is no visual advantage to downloading. 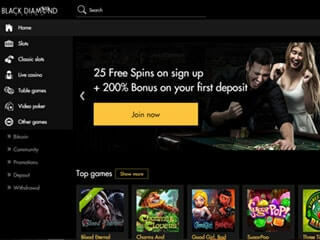 As far as instant play is concerned, many gamers register at a number of casinos. No single casino can carry every great game so plyers look for the better way to access games from a number of casinos. It’s also much easier to try out a casino via instant play than via download. The fact is that most players who come to Black Diamond to try out their games stay to play because of ….the games! Mobile is so convenient and so much better visually than just a few years ago, that it is overtaking desktop gaming. The large majority of players already play on their mobile devices – phone and tablet. While you’re still gaming online and have the urge for some live casino action, instead of packing a suitcase, making reservations, and travelling to a land-based casino, go to the Live Casino at Black Diamond! The Live Casino offers roulette, blackjack, baccarat, and Super 6 in an elegant setting. You can interact with the dealers who will be more than happy to see you win! 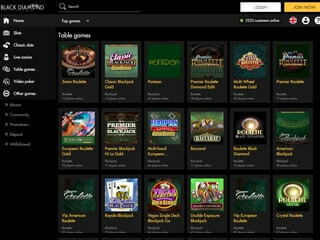 Black Diamond has about 120 great games from three providers: Betsoft, Octopus Gaming, and VIG. There is no dross on Black Diamond. Some casinos brag about having 500 or more games. Unfortunately, many of those 500+ games are out of date in terms of content and graphics. 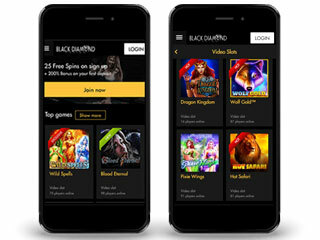 Black Diamond is a crystalline casino, featuring the best games from the three developers. The game leader is slots, of course. Win or lose, you’ll love playing the wonderful slots at this casino. The casino has both fresh and classic slots. The classic slots are true classics, not slots that have lingered on other casinos for (seemingly) generations. The casino also has a fine selection of table games. Blackjack dominates the list of table games. This is one of the more cerebral games offered at any casino. One thing that online blackjack players like about playing online over playing at a brick and mortar casino is that online there are no other people at the table to blame you for “taking” their winning card! In addition to blackjack, you can play American and European roulette. We urge our readers to forego playing American roulette and to choose European roulette instead. The latter roulette variation has only a single 0, not the 0 and 00 of American roulette. By eliminating the 00 European roulette cuts the house advantage in half. The other highly cerebral game at any online casino is video poker. Black Diamond carries 33 video poker games each with its own variation on the standard poker scale of hands. It pays, first of all, to play any variation that you are not thoroughly familiar with in free play mode. In this way, you can learn the games and decide if it’s the video poker game you want to play for real money. We’ll share an important bit of video poker strategy. Just as in slots you need to bet the maximum to qualify for the highest win, in video poker you have to do the same. Although the big payouts are for hands that come along very infrequently, the amount you can win by betting the max is far above the amount you can win if you don’t bet the max. So, when playing video poker as when playing slots, find a game where the max bet is well within your budget. Black Diamond is as aware of the possibility that problem gamblers may choose to play there. As socially conscious as the casino is vis a vis the environment, it is even more aware of its corporate responsibility to help gamblers who gamble away money they cannot afford to lose. So, determine your gambling budget as an aspect of your overall entertainment budget and stick to it. Gambling online should be fun and entertaining above all. The casino always runs many promotions. Some change weekly while others are enduring classics. You can receive massive bonuses in cash or free spins. Black Diamond offers a large variety of bonus codes to choose from – pick the bonus code which most appeals to you and get started. The casino runs many tournaments in slots and blackjack. The top prize is always guaranteed in these tournaments. Whereas most casinos have a comp points program, the Jewel of Curacao designates all players as VIPs and all are charter members of the VIP Club. As your accumulated points rise to a sufficient level, you receive a personal account manager who finds ever more jewel-like ways to reward you for playing at Black Diamond. Black Diamond protects your money with the most sophisticated SSL encryption software. Your money is safe from the moment it leaves your bank to the moment your withdrawal arrives at your bank. The customer service office is open every day including international, national, and religious holidays. You can reach the excellent staff through chat, toll free telephone, or email. Let’s see if we can mix a couple of metaphors and get our message across! If we see all the online casinos out there, the good with the less good, we might say that finding a very good casino is like finding a diamond in the rough. Hopefully, our Black Diamond Casino Review has found that diamond in the rough and shown it to be a truly shimmering and sparkling diamond for you.